Meet Sophie LaCroix, a creative soul with a desire to become a great film director someday, and she definitely has a flair for drama! Her overactive imagination frequently lands her in trouble, but her faith and friends always save the day. From best-selling author, Nancy Rue, comes two-in-one bindups of the popular Sophie series. Sophie Flakes Out: Sophie wants more privacy like her friend Willoughby, who has plenty, until Willoughbys father finds out about her fast, new friends. His harsh punishment makes Sophie wonder what rules they need to follow. Sophie Loves Jimmy: Sophie doesnt get why a rumor should stop her from being Jimmys friend  until the Corn Flakes start believing the whispers. Now Sophie wonders how she and the Flakes can ever be friends again! Sophie Flakes Out by Nancy N. Rue was published by Zondervan in April 2013 and is our 22703rd best seller. The ISBN for Sophie Flakes Out is 9780310738541. 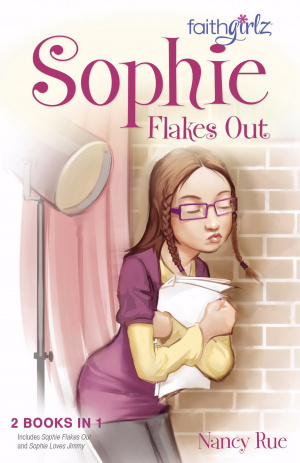 Be the first to review Sophie Flakes Out! Got a question? No problem! Just click here to ask us about Sophie Flakes Out.